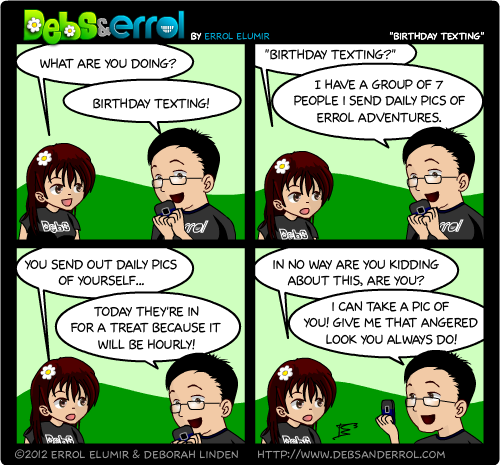 Errol: The comic is correct. I take a pic, every day, usually of myself posing with something, and send it off to people with a stupid caption. Today, I will… send more. Debs: Wait, 7? I thought there were only 5! Who did you add? This seems like a wonderfully terrible idea. Adventures with Errol include: waiting for the bus! Eating lunch! Unimpressed children! Wearing funny hats! Now I’m just curious to see what this is like. It’s random, and would be good for a few laughs, but would probably keep me more amused than reddit. But it’s random minutia. I LOVE RANDOM MINUTIA. Except twitter. Twitter can burn for all I care. I’m the guy who looks for the easter eggs in Pixar movies. Happy Birthday Errol. I would have sent my regards earlier, but I wasn’t getting the site properly for most of the day. Yeah, kept getting old CloudFront (or whatever they’re called) cached versions of the site… The RSS-feed updated on schedule with the new comic, but I wasn’t able to get in. Maybe they just cut it down to everything bar the international traffic or something? Maybe a router was down somewhere between here and the UK.